Professor Elizabeth Hartland is the Director and CEO of Hudson Institute of Medical Research and the Head of the Department of Molecular and Translational Science at Monash University. 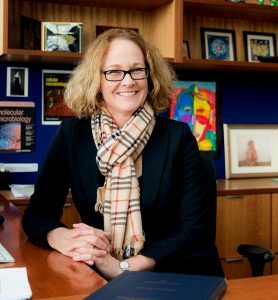 Prior to joining Hudson Institute, Professor Hartland held the positions of Head of the Department of Microbiology and Immunology, University of Melbourne, Deputy Director of the Doherty Institute for Infection and Immunity and Acting Pro-Vice Chancellor Research Partnerships and External Relations at the University of Melbourne. Professor Hartland undertook her undergraduate and graduate training in biochemistry and microbiology at the University of Melbourne. She has held a Royal Society/NHMRC Howard Florey Fellowship in the Department of Biochemistry, Imperial College London and Lecturer/Senior Lecturer positions at Monash University. She was an inaugural Australian Research Council Future Fellow at the University of Melbourne. Professor Hartland has a long-standing research interest in the pathogenesis of infections caused by bacterial pathogens, with a focus on the genetic mechanisms of microbial colonization and immune evasion.